Central Eleuthera is from the Governor's Harbour Airport south to Savannah Sound. Follow the Queens Highway twelve miles from Governor's Harbour Airport, and you will be at the very center if Eleuthera in the settlement of Governor's Harbour. While making this journey you will pass some notable locations including, Cocodimama, the Wykee Estates Community, and the Sky Beach Club. 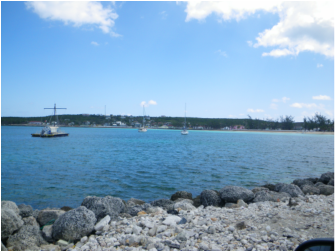 You will be blown away by the spectacular beauty of Governor's Harbour and Cupids Cay as you arrive. Governor's Harbour is the capital and largest settlement on the island, home to approximately 1500 people. Here you can gather almost all of your vacation necessities. There are multiple grocery stores, liquor stores, restaurants, bars, and banks, a gas station, hardware store, dive shop, doctors office, laundromat, a mechanic and tire shop, the islands only movie theater and of course the Friday night fish fry. There are also numerous vacation rentals located in and around Governor's Harbor. For your first vacation on Eleuthera I would recommend staying near this area, due to its central location and close proximity all your basic needs. Leaving Governor's Harbor you can take one of two routes to get to the next settlement. The main route is to stay on the familiar Queens Highway and follow it through town. The other route is to take the Banks Road which runs along the Atlantic side of the island. To take the Banks road turn left (onto Haynes Ave.) just as you enter Governor's Harbour from the north, at the bright yellow liquor store with a giant Kalik logo on the side. Follow the one way road to the top of the hill, you will pass the Buccaneer Club and the Pina Café on the right. At the top of the hill you will get to a stop sign and take a right. You are now on Banks Road as you head down the hill you will see the doctor’s office on the right; it is a good place to remember just in case. At the bottom of the hill and up about a quarter mile is the access to the beautiful Club Med Beach and next to it is our favorite stop, the Beach House restaurant. While continuing along you will pass, the Leon Levy Plant Preserve, the Banks Road Deli, Pineapple Fields Resort, Tippy’s restaurant, Oceanview Farm's stables, and multiple vacation homes and rentals. After about five miles you will reach North Palmetto point, a moderate sized community by Eleuthera standards. This Banks Road and Palmetto Point area sees a lot of tourist traffic due to the numerous homes ans vacation rentals in the area so it is home to quite a few markets. If you are staying in this area you will be able to take care of almost all your basic shopping needs here without making numerous trips to Governors Harbour. If you keep following the Banks Road past North Palmetto Point (after a few turns and bends in the road), you will be able to follow it for about another 3 miles, but not far past Unique Village it will become a rougher narrow sandy road. This entire eight mile long Banks Road area from Governors Harbour on has only a couple beach accesses but is home to a large chunk of the islands vacation rentals. If you keep following the Queens Highway straight through Governors Harbour you will go past both greocery stores, a couple of liquor stores, the dive shop and many other establishments on your way through town. About five miles farther down the road you will reach what they call the Palmetto Point intersection at Queens Highway and Church Street. There is no stop sign or large signs, like we are used to in the states, but you will have just entered a 15mph zone, there will be Sands grocery on the SW corner other plus multiple signs for a variety of residents, establishments, accommodations and other things. If you take a left you will head into North Palmetto Point. If you take a right you will go through the South Palmetto Point settlement. South Palmetto point has Mate and Jenny’s pizza, a market, a beautiful public beach at the north end and a marina at the south end along with lots of permanent residents and vacation homes. Exactly a half mile from the Palmetto Point intersection is Island Farms on the right hand side. Don’t miss stopping here for some fresh veggies, sauces, and bread (Tuesdays and Fridays). Three miles past the Palmetto Point intersection you will see the road to Double Bay on the left. There are some spectacular vacation homes and rentals in this area. Just under a mile past the turn to Double Bay you will see a tiny sign on your right for Ten Bay. If you were not completely distracted by the beaches at Double Bay and Ten Bay you will quickly arrive in Savannah Sound.